If you want to communicate via E-Mail in a secure way, activate S/MIME for your E-Mail-Account in the settings of your iOS-Device. S/MIME was first introduced by Apple in iOS 5. Maybe you experienced an E-Mail from a friend where the subject line seems a little odd. Upon opening the E-Mail you noticed that it was SPAM. Somehow a spammer was able to use your friends E-Mail address (spoofing an address) which, understandably, made you feel comfortable enough to open and read the message. These experiences forced the need for having a more secure form of E-Mail. If you send a letter through the post office do you simply print a piece of paper and drop off in a mailbox, or do you put it in an envelope? If you are worried about people reading your message, why do you send an email without a ‘virtual envelope‘? As an email passes through routers, switches, and from one mail server to another without it being inside a virtual ‘envelope’ (thus encrypted), anyone could look at your letter. Secure/Multipurpose Internet Mail Extensions (S/MIME) can secure your mail by encrypting a message at the source and only decrypting it once it’s in the hands of the receiver. S/MIME also supports digital signatures, so you can know for sure who sent the message and that it wasn’t changed in transit. If S/MIME is activated the iOS-Mail application will show a little checkmark (within a gearwheel) after the sender’s name if a message was signed. If something is wrong with the certificate or the message was changed after it was signed, iOS-Mail displays the senders name in red followed by an open padlock. A common reason for signature failures is people using self-signed certificates or using CAcert, which isn’t considered a trusted authority by Apple and others. The bad news is that you normally have to pay for a Digital ID from a Certificate Authority (CA) e.g. VeriSign. If certificates are cheap (or even free) the certificate authority only checks whether the person requesting a certificate is actually in control of the E-Mail address in question, with no actual identity checking. A Class 1 Digital ID e.g. from Symantec/VeriSign. Wait for confirmation and issue. It may last up to several days depending on the verification strategy of the CA. CA issues your digital certificate for installation on a PC/Mac. Follow the instructions of CA, when you get the download link for your certificate. Install the certificate in the certificate storage of Safari/Internet Explorer. Export it using file format PFX. Send the PFX-File as an attachment to the appropriate E-Mail-Account (the account the certificate was applied for). Open it on your iOS-Device and tap on the attachment (PFX-File). iOS identifies this format as an importable Identity Certificate for installation as a Profile. Follow the instructions. Pay no heed to any strange message. Two additional sections (Sign, Encrypt) will be displayed. Turn on Sign and Encrypt. You can select one of the certificates you own a private key for. Clicking it puts a checkmark next to it and this is the certificate that will be used to sign all outgoing messages from this account. Send a Mail to the recipient. 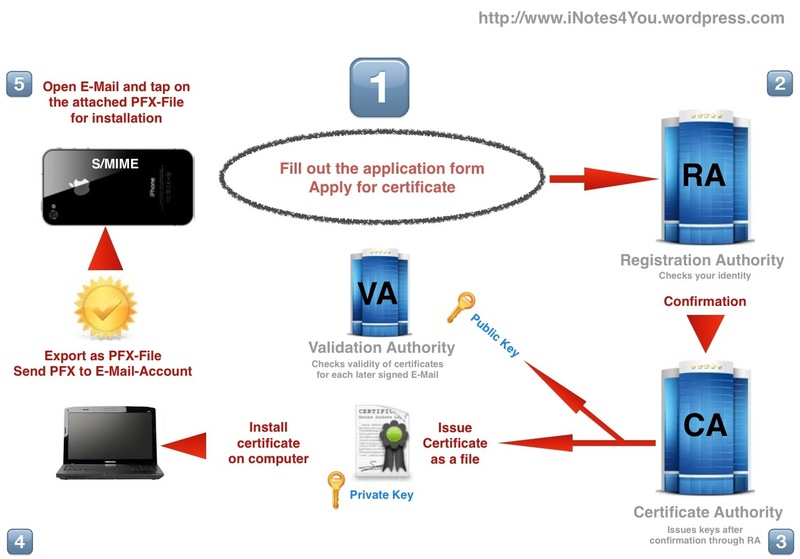 The Recipient must install your certificate (by tapping on the sender’s name) for future secure communication. Apple has chosen to not indicate that a message was signed in the standard configuration under iOS. To enable this feature, you have to go into the Settings… Account… Advanced for each E-Mail-Account, and then enable S/MIME. If you have other iOS-Devices you have to repeat all steps for every device. Recipients will get an attachment smime.p7s if you send an E-Mail with your certificate. This attachment can be ignored. 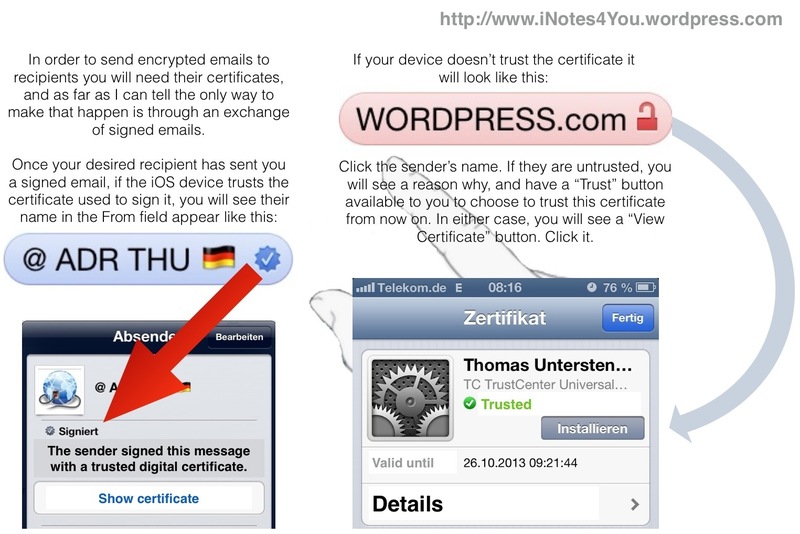 iOS doesn’t automatically store the certs of people who sent a signed E-Mail to you. Instead, when someone has sent you a signed message, you have to tap the sender’s name and then you can install the certificate for future use. If you try to send a message to someone you don’t have a certificate for while encryption is enabled, their name turns red to alert you to the problem. A lock icon indicates that a message was encrypted.